The top lot at $48,800 was Alfred Jacob Miller’s (American, 1810–1874) “Caravan en route (Stewart’s caravan),” a pen, pencil and ink wash on paper, circa 1837. The 12½-by-18¾-inch work was won on a phone bid against two other competitors and is going to the Museum of Nebraska Art. 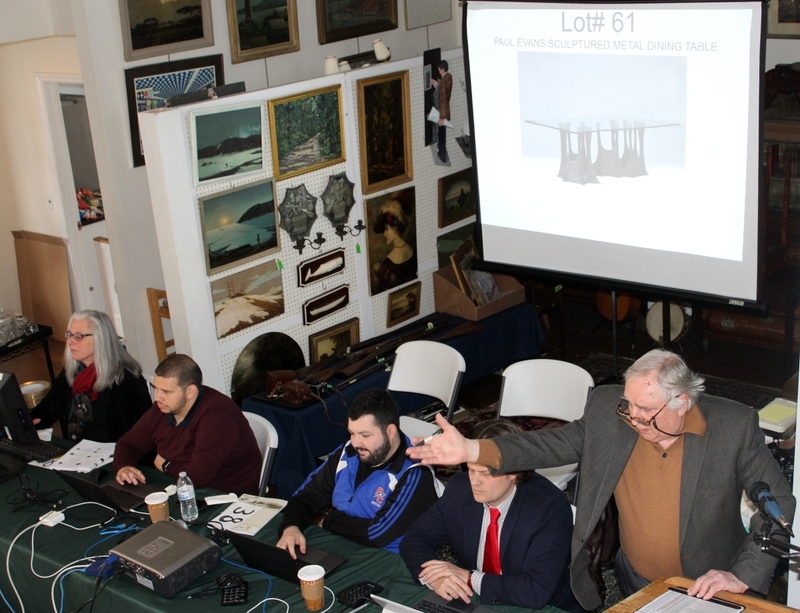 BEDFORD VILLAGE, N.Y. – Brendan Ryan of Butterscotch Auction knew the firm had a great object of historical Americana in the lineup heading across the block on March 25 in its estate auction staged inside Historical Hall. 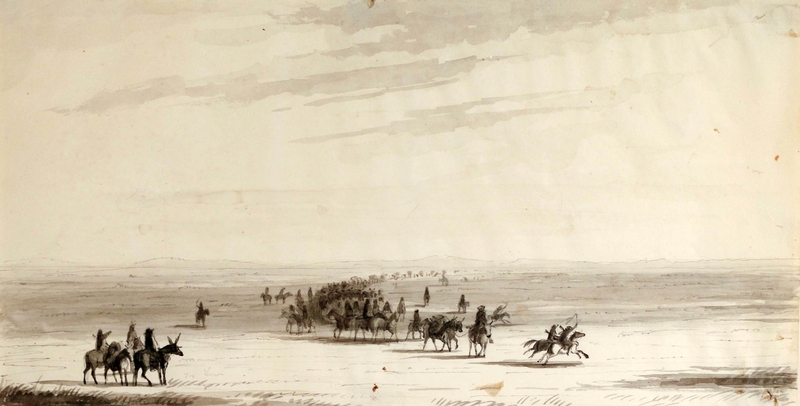 That certainty was borne out by the $48,800 attained for Alfred Jacob Miller’s (American, 1810-1874), “Caravan en route (Stewart’s caravan),” a pen, pencil and ink wash on paper, circa 1837. The 12½-by-18¾-inch work was won on a phone bid against two other competitors and is going to the Museum of Nebraska Art in Kearney. Catalog notes outline the genesis of the trailside sketch, describing Miller’s invitation from the retired British army captain Sir William Drummond Stewart to accompany him on a six-month expedition to the Rocky Mountains where they would witness the rendezvous of fur trappers and traders on what would become the Oregon Trail. Ryan said that this particular sketch is related to at least seven others by Miller. Six of those show Stewart seated on his white horse in the center of the caravan. He is noticeably absent in this sketch, suggesting an early date of 1837 and the likelihood that it was a quickly executed study as a basis for Miller’s later oil of the same subject completed around 1850. The work came from the artist by descent to first his grandniece Louisa Whyte Norton; Old Print Shop, New York (1947); purchased from the above by the consignor’s grandfather. The Old Print Shop was an underbidder on the lot. “It’s a beautiful little work, a pivotal piece,” said Teliza V. Rodriquez, curator at the Museum of Nebraska Art, which has a couple of other, more finished works by Miller in its collection of Nineteenth Century American art. She added that it will go on display there as soon as possible. 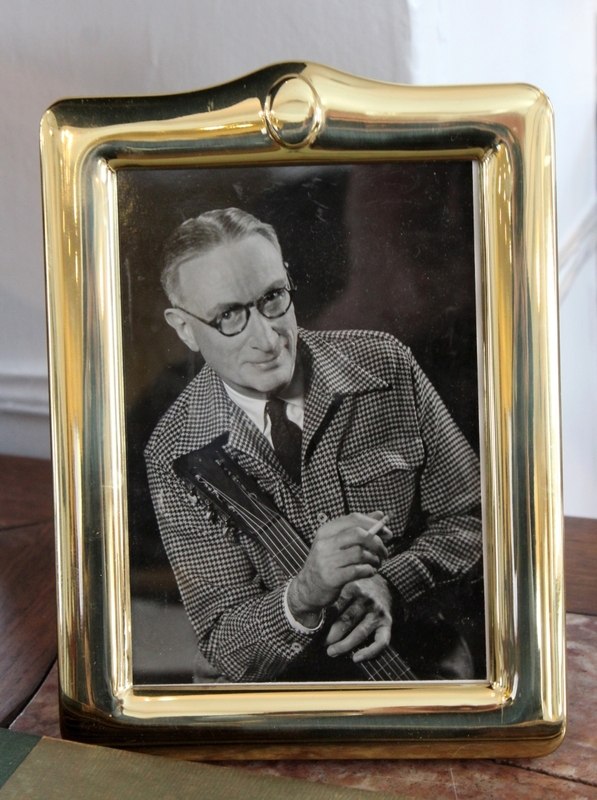 In addition to the Miller sketch, the sale was packed with Midcentury Modern material and a trove from the multitalented John Allison, songwriter, arranger and historian of American folk music. Paul Marinucci takes a bid on the Paul Evans table from the stage. A Paul Evans sculptured metal dining table led Midcentury Modern furnishings, reaching $19,520. 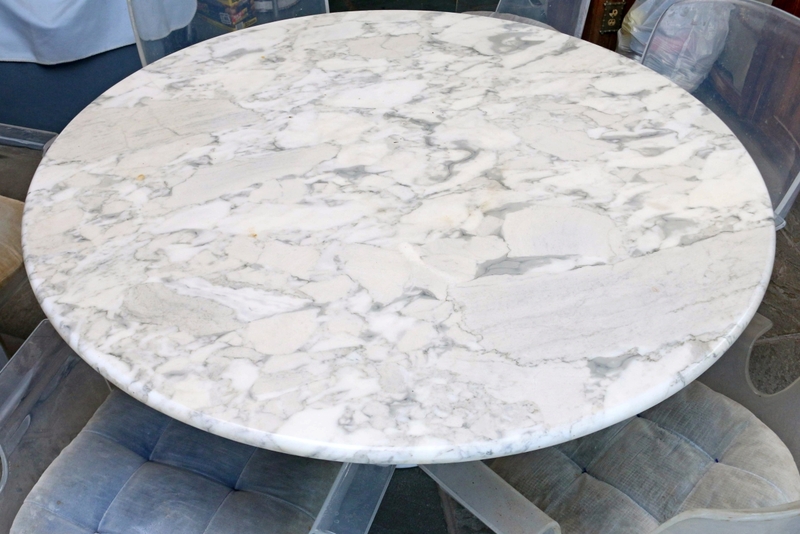 As he hammered the lot down, auctioneer Paul D. Marinucci quipped, “For that price, we’ll deliver it.” The circa 1970 “Stalagmite” table for Directional, which came out of a private Greenwich, Conn., estate, did not suffer a lack of man-handling. 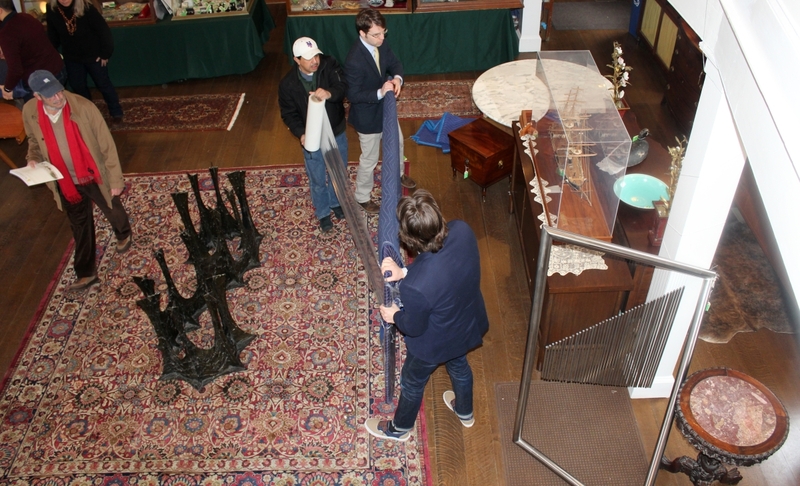 A feature of the Butterscotch Auctions that are conducted in the Nineteenth Century Historical Hall is that many of the key items on view on the hall’s main floor prior to the Sunday sale have to be moved out to accommodate chairs for in-house bidders. So as preview came to a close, Butterscotch staff and helpers carefully wrapped the table’s glass top, 84 by 48 inches, in bubble-wrap and gingerly moved its one-piece, S-shaped bronze and resin composite base. A set of six Carlo Malnati “Bambi” dining chairs that were arrayed around the Evans table were also moved out prior to the auction. 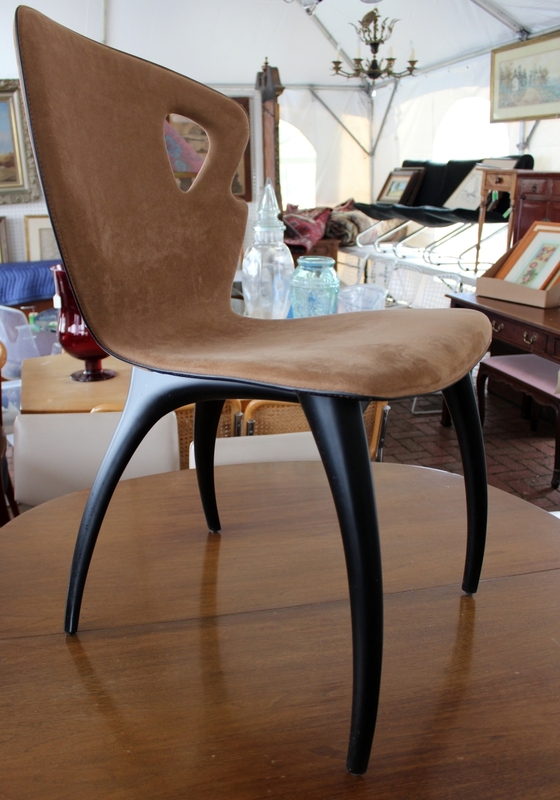 Late Twentieth Century, in suede “alcantara” upholstery with sculpted backs and organic reverse-klismos-style legs in polished black composite, they would later go to a phone bidder at $1,220. 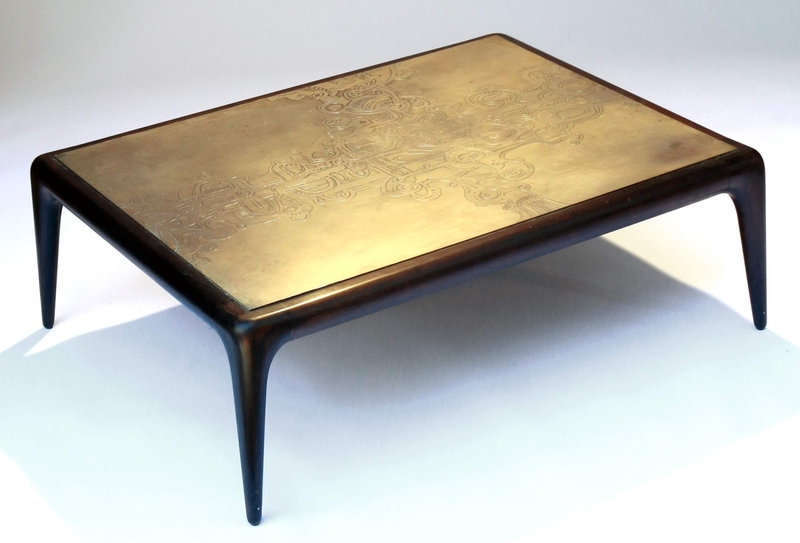 More Midcentury Modern fare followed as a rare Vladimir Kagan coffee table, circa 1960s, with an oak base an acid-etched brass top crossed the block. 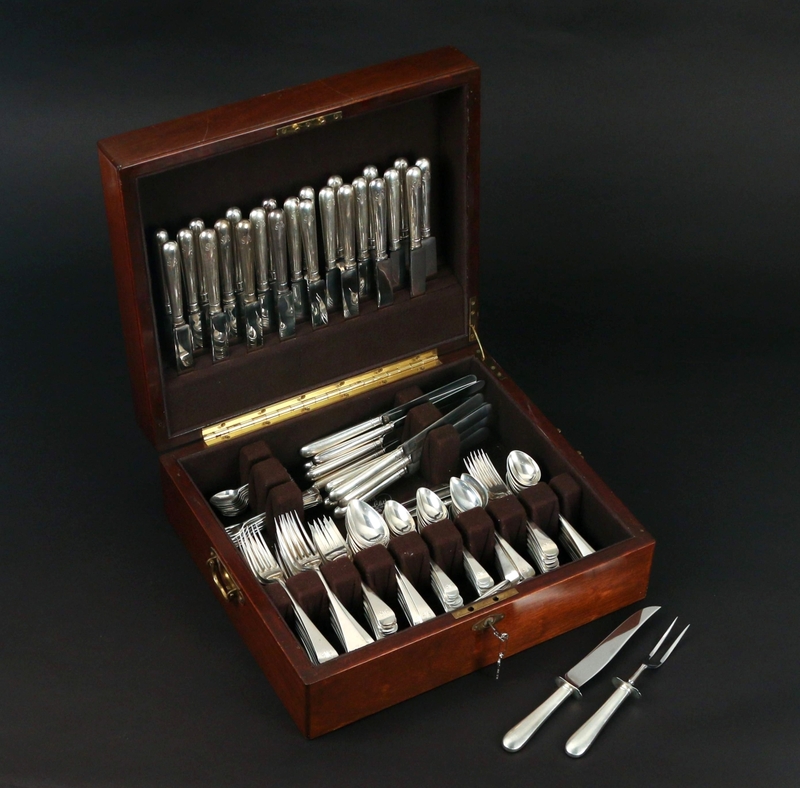 The auction house in its catalog description for this lot cited another example of the rare design, although with different top, as having recently been sold by Piasa at a November 2017 Paris auction. This example, however, had been purchased by the consignor at Kagan’s New York City shop in the 1960s. 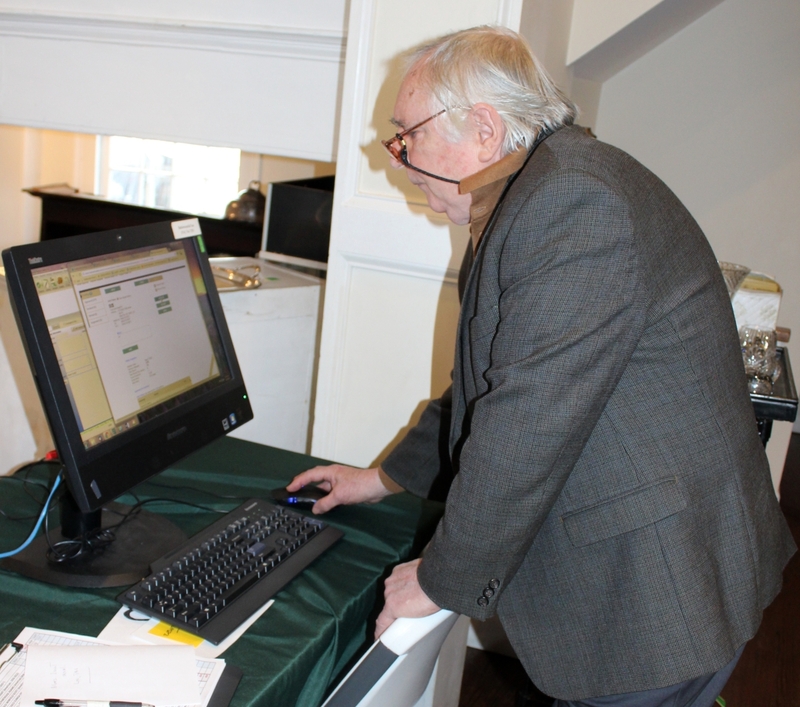 It was won by an online bidder for $6,710. 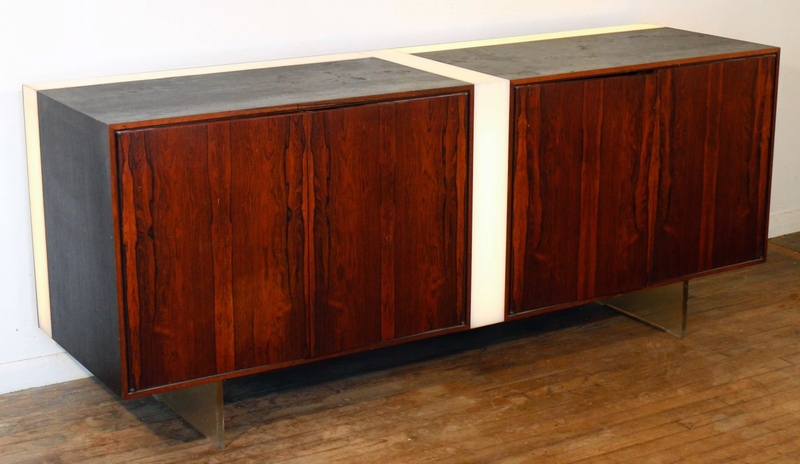 Another Kagan piece, a rare circa 1965 illuminated cabinet of rosewood, acrylic and lucite, had been rescued from a Pleasantville, N.Y., estate that had seen some water damage from a leaky roof. According to Butterscotch’s Ryan, one of the cabinet’s two doors had been a bit warped when it was removed from the house but miraculously once taken out of the damp environment, it straightened out. Still, it would benefit from some TLC, although its lighting, one of the piece’s key features, was working. It also went to an internet buyer, realizing $4,636. 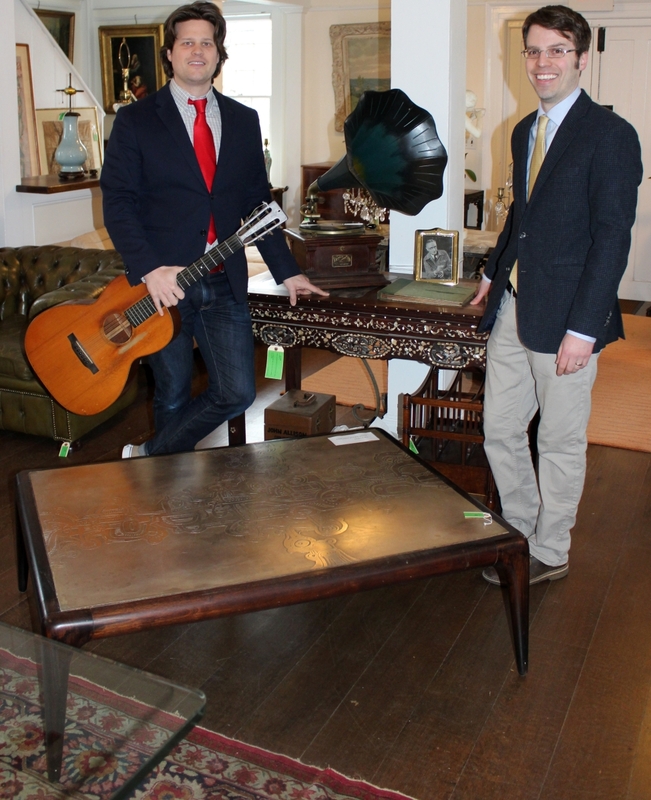 As with many estate sales, there were surprises and bargains. On the good side, a Francis Fry copy of Bishop’s Bible, London, 1752, containing an autograph letter on the inside cover by the English bibliographer and book collector, easily outperformed its $3/5,000 estimate to command $12,700. Action on this lot was all online, primarily by two bidders. The Bishops’ Bible is an English translation of the Bible that was produced under the authority of the established Church of England in 1568. 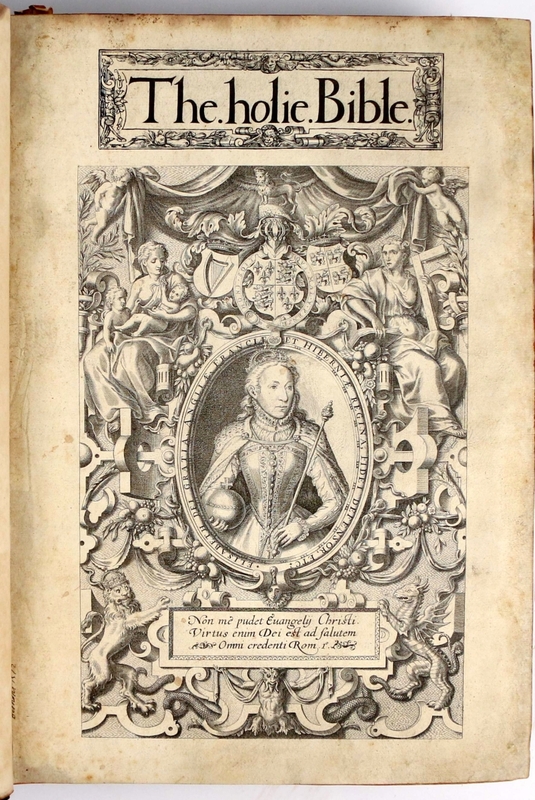 It was substantially revised in 1572, and the 1602 edition was prescribed as the base text for the King James Bible that was completed in 1611. 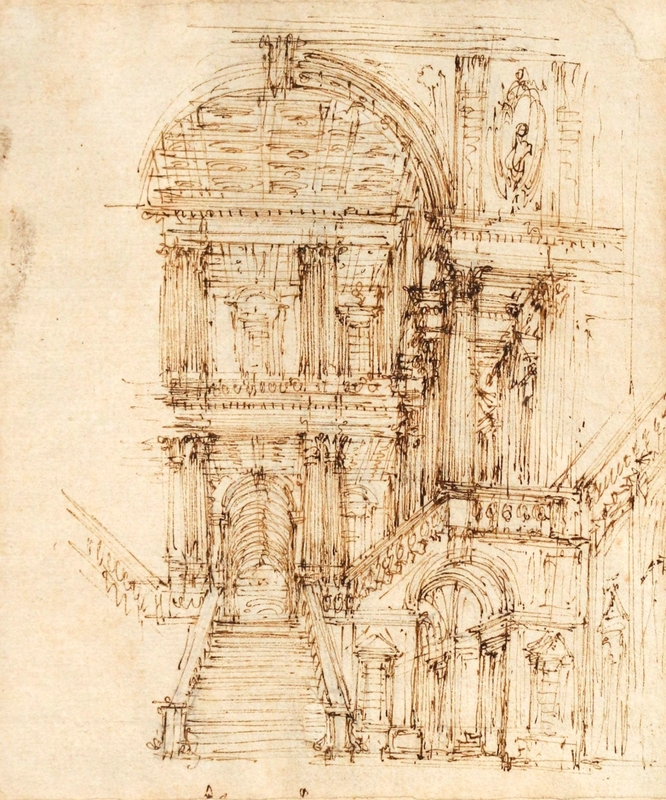 A big price was also achieved for a pen and ink on paper work by Giuseppe Galli Bibiena (Italian, 1696-1756), “Staircase of a Palace,” which was from the same consignor as the Miller sketch and had descended in the family. 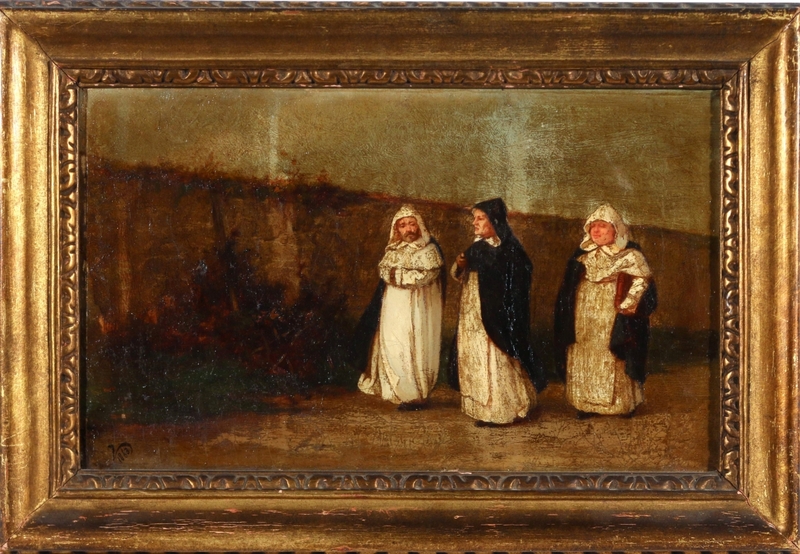 With no apparent signature and framed with an old exhibition label from the Art Institute of Chicago, it rose steadily from a $500 opening price to a final price of $10,370, won by a phone bidder. 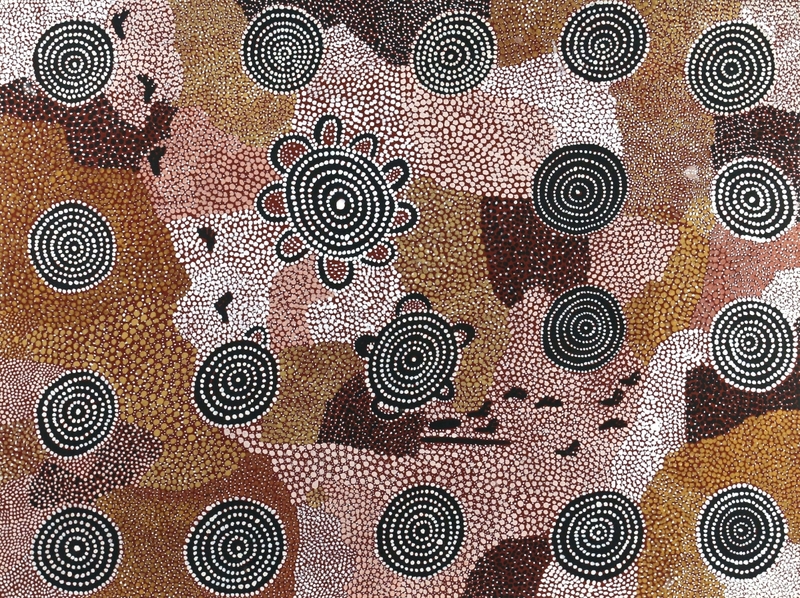 One of the founders of Papunya Tula Artists and most renowned painter of the desert art movement, whose signature techniques of overdotting produced effects of “tremulous illusion,” Johnny Warangkula Tjupurrula (1918-2001) was represented in the sale by “Kamparapa Landscape,” a 36-by-48-inch oil on canvas alive with swirls of dots. Papunya Tula Artists inhabited the sandhill country in the vicinity of the Northern Territory / Western Australian border. Going to a phone bidder for $5,368, this painting bore catalog no. JW7907, signed and with address on verso and a Carol Condit Galleries label on the frame. Among the local estates that contributed the 829 lots comprising this auction, a significant source emanated from the Pound Ridge, N.Y., collection of John W. Allison (American, b 1893). A singer, composer, lyricist, and collector of folk songs, Allison’s first ambitions, however, were in graphic arts. Influenced by his friend and teacher Van Perrine (1869-1955) as well as Albert Pinkham Ryder, Allison had solo shows of his paintings at New York City galleries in the early 1930s, and some of his works were included in group shows, notably at the National Academy’s annual exhibit in 1937. A Paul Evans sculptured metal dining table led Midcentury Modern furnishings, reaching $19,520. 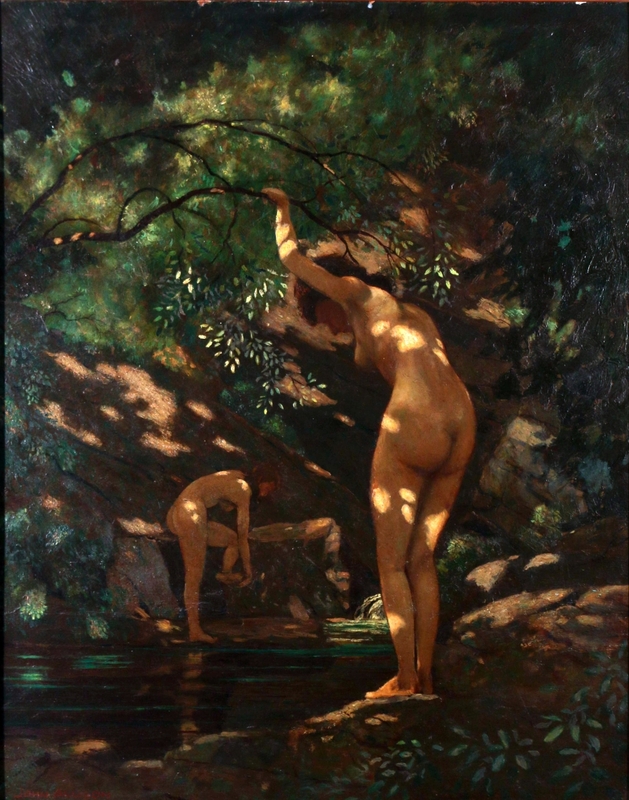 More than 30 of his paintings were offered in this sale, the highest price achieved for “Rock Pool,” an oil on Masonite, 30 by 25 inches, which was won by an internet bidder for $2,413. A small vignette devoted to the multitalented artist was staged at preview, consisting of an early Victor Vic III talking machine, which Allison undoubtedly used to play 78 rpm recordings of the likes of Fats Waller and his Rhythm performing “Your Feets Too Big” and Allison’s own “Ballads of the American Revolution and the War of 1812,” a program of early American songs sung by John and Lucy Allison. Also, crossing the block (for a second time) was Allison’s Martin 000 acoustic guitar, circa 1929. As Butterscotch’s Ryan explained, its return to the podium was not because it was a defective lot – the bidder in the earlier sale had proved to be “defective,” i.e., nonexistent. “When we called the winning bidder, a well-regarded dealer, after the sale to let him know he had won the guitar, he said, ‘I don’t know what you’re talking about,’ so clearly his identity had been used without his knowledge,” recalled Ryan. This time the guitar sold successfully for $5,368 and Ryan said he was pleased to have learned recently that the earlier fake bidder had been arrested and was now in prison in the Philippines. 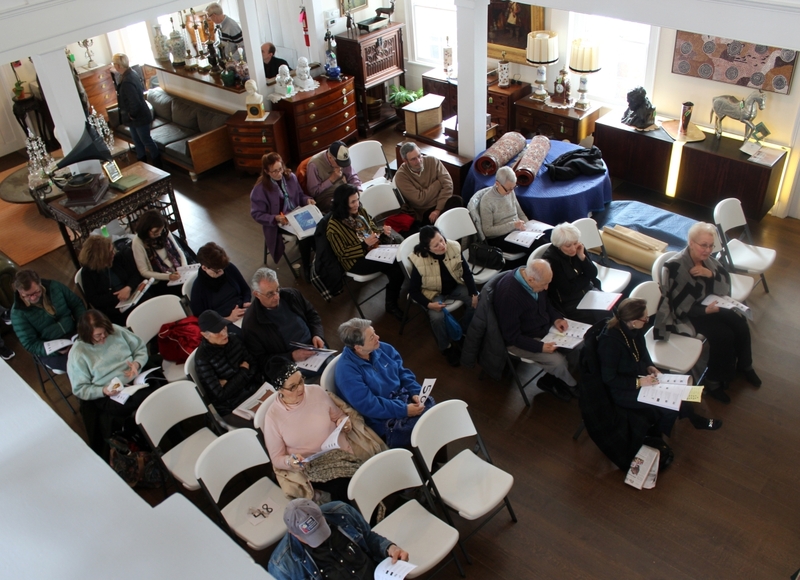 Other highlights in the sale included an Italian white and gray marble table, circa 1960s, by Angelo Mangiarotti for $7,620, silver flatware for $6,710; an Heriz carpet, also for $6,710, and an Elihu Vedder (American, 1836-1923) “Landscape with Three Monks” from a private North Salem, N.Y., collection that was bid to $4,392. Prices reported include the buyer’s premium and reflect the internet surcharge, where applicable. For further information, www.butterscotchauction.com or 914-764-4609. 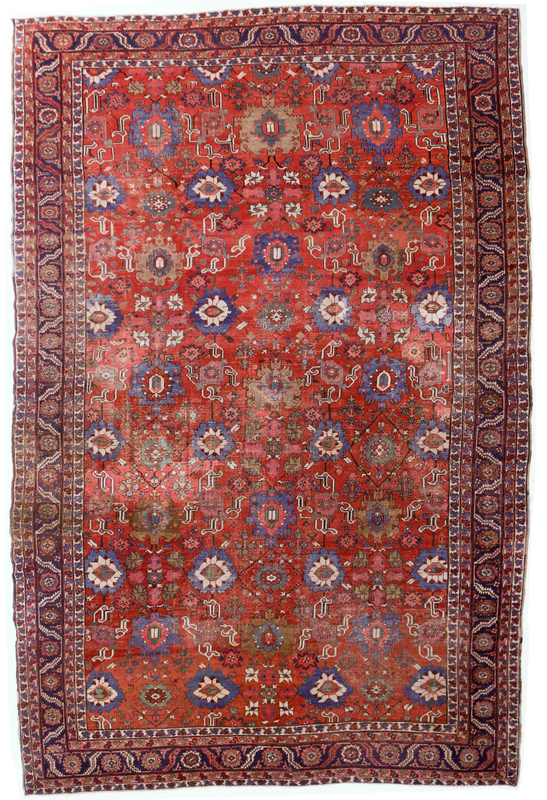 An Heriz carpet went out at $6,710.